The Asus F7Se (£647 inc. VAT) is a desktop replacement machine. With a large display and a dedicated graphics card, it's ideal for multimedia use. The 17-inch Super-TFT screen features accurate colours, although the glossy ﬁnish proved more reﬂective than its rivals. A resolution of 1440 x 900 pixels is average for a panel of this size, offering enough space onscreen to open several windows simultaneously. There's an ATi Mobility Radeon HD 3470 graphics card, but in this case it's a single GPU solution, doing without ATi's Hybrid graphics. 3D performance was similar, allowing us to play the latest games, but in reduced detail settings. The F7Se's large size creates plenty of space for the user interface. The keyboard is one of the more comfortable we've used and the responsive keys move with a well-judged travel. The keys are all of a good size, and a numeric keypad to the right makes it easier to enter data. Build quality is good, with thick and sturdy plastics used for the chassis, and a strong screen surround that offers plenty of protection for the display. A strip of brushed aluminium on the front of the chassis, along with brushed aluminium touchpad buttons, create a premium feel, although the dull grey plastic lid is not the classiest. The Asus features a Centrino chipset, which includes a previous-generation Intel Core 2 Duo T5750 processor. Performance is still respectable, helped by 3072MB of memory, but lag is apparent when running multiple applications. Battery life also failed to impress, lasting for just over two hours during our tests. As a machine likely to spend most of its life on your desk, this isn't too much of a problem, but it does hamper mobility if you want to take it on the road. Wireless networking is limited to 802.11g speeds, rather than the faster 802.11n adapters found on rival machines, but it's still ﬁne for regular home use. The inclusion of ﬁve USB ports makes it easy to connect all your peripherals simultaneously, and an HDMI adapter lets you plug-in a high-deﬁ nition (HD) TV. 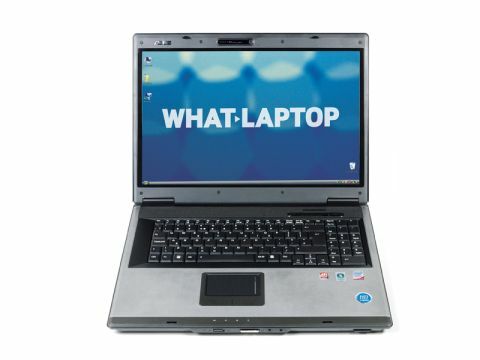 Other features include an eSATA interface, which lets you transfer data to an external disk at high speeds. It may not be the most stylish laptop, but if you're after a multimedia system to replace your desktop PC, there is a lot to like about the Asus F7Se. We found it comfortable, well equipped and easy to use.